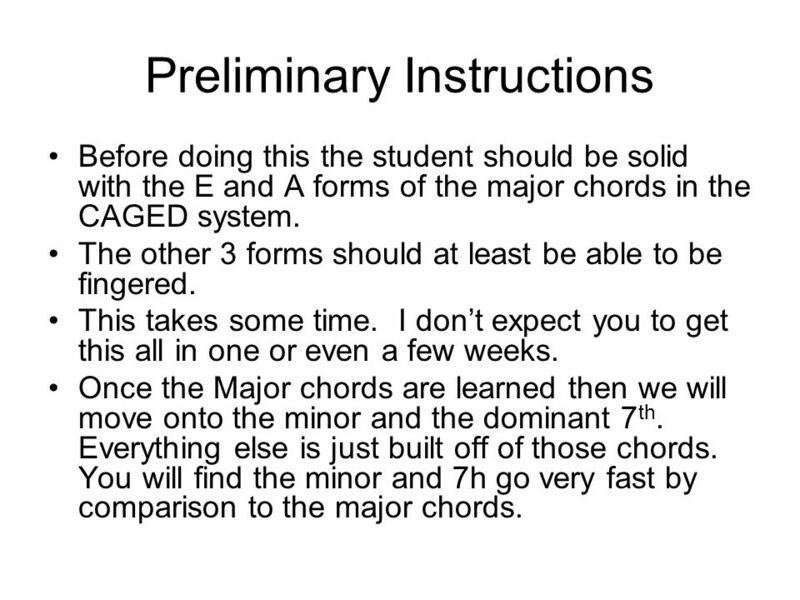 Before doing this the student should be solid with the E and A forms of the major chords in the CAGED system. The other 3 forms should at least be able to be fingered. This takes some time. I don’t expect you to get this all in one or even a few weeks. 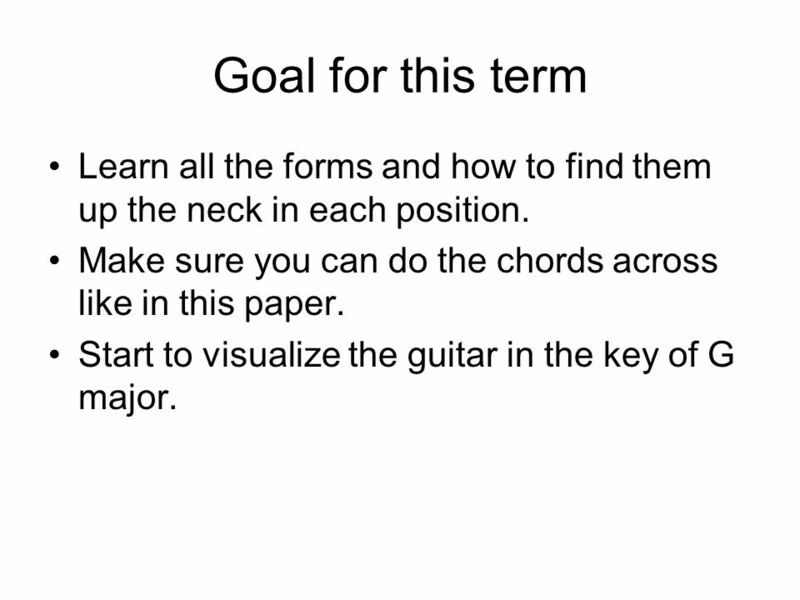 Once the Major chords are learned then we will move onto the minor and the dominant 7th. Everything else is just built off of those chords. You will find the minor and 7h go very fast by comparison to the major chords. 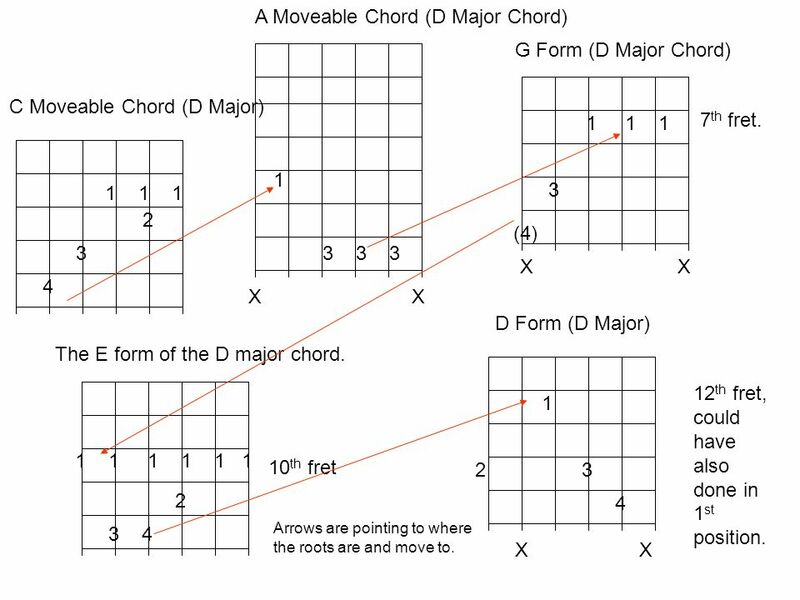 3 More than just chords These chord forms are also the basis for scales, arpeggios and licks. While you will start with the chords realize that it goes well beyond this. 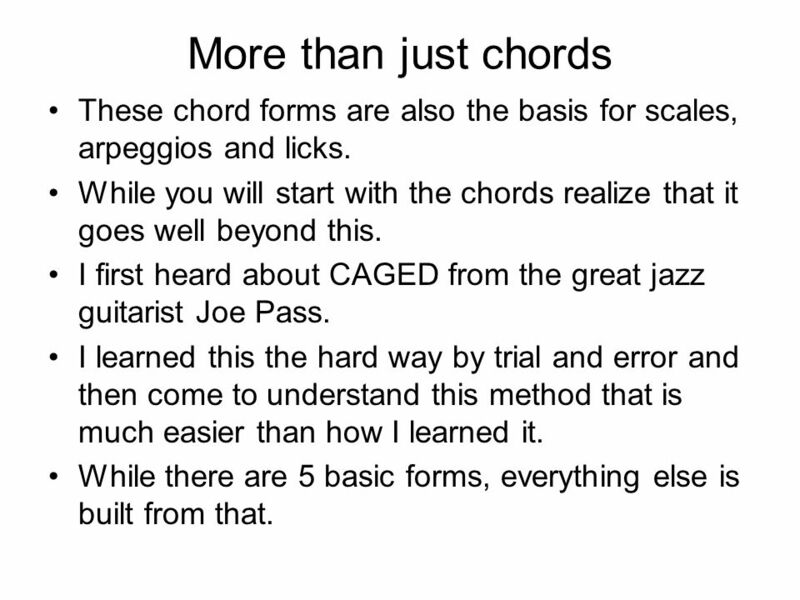 I first heard about CAGED from the great jazz guitarist Joe Pass. I learned this the hard way by trial and error and then come to understand this method that is much easier than how I learned it. While there are 5 basic forms, everything else is built from that. Will start in the key of G major. 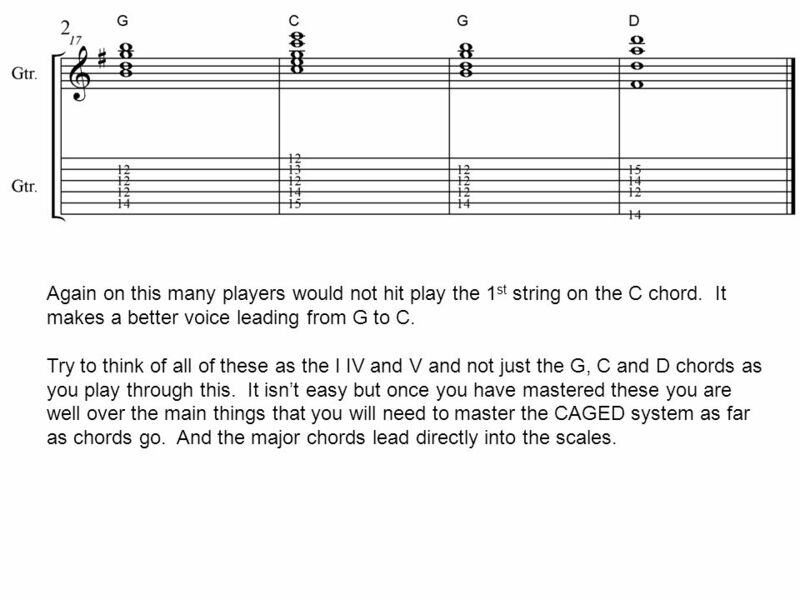 The 3 principle chords in any key are the I, IV and V Chords. 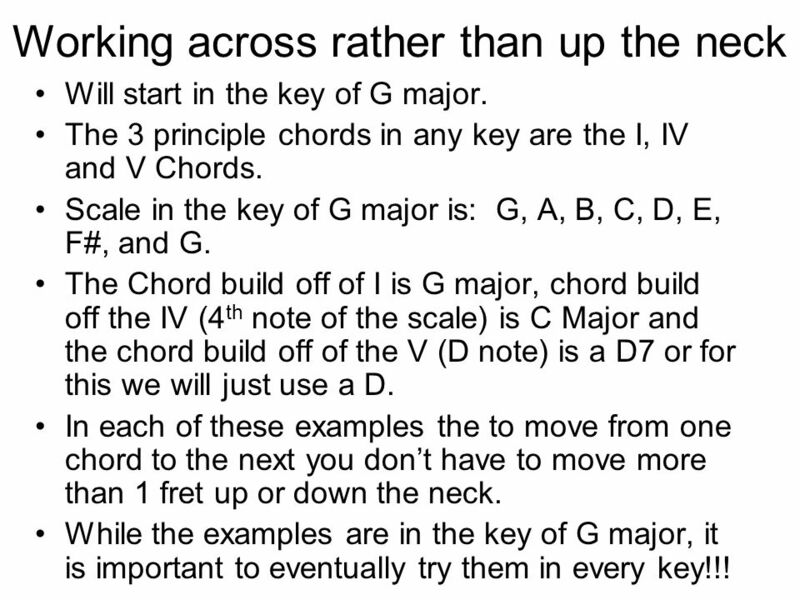 Scale in the key of G major is: G, A, B, C, D, E, F#, and G. The Chord build off of I is G major, chord build off the IV (4th note of the scale) is C Major and the chord build off of the V (D note) is a D7 or for this we will just use a D. In each of these examples the to move from one chord to the next you don’t have to move more than 1 fret up or down the neck. 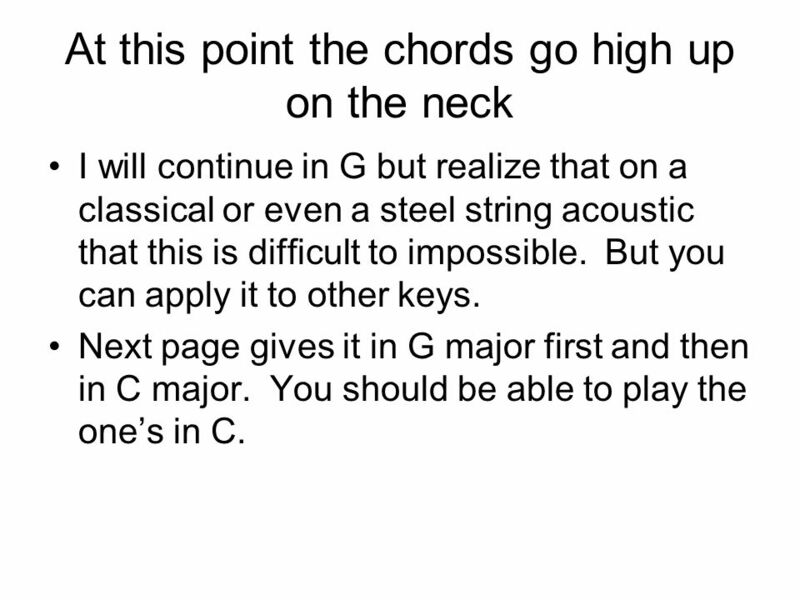 While the examples are in the key of G major, it is important to eventually try them in every key!!! 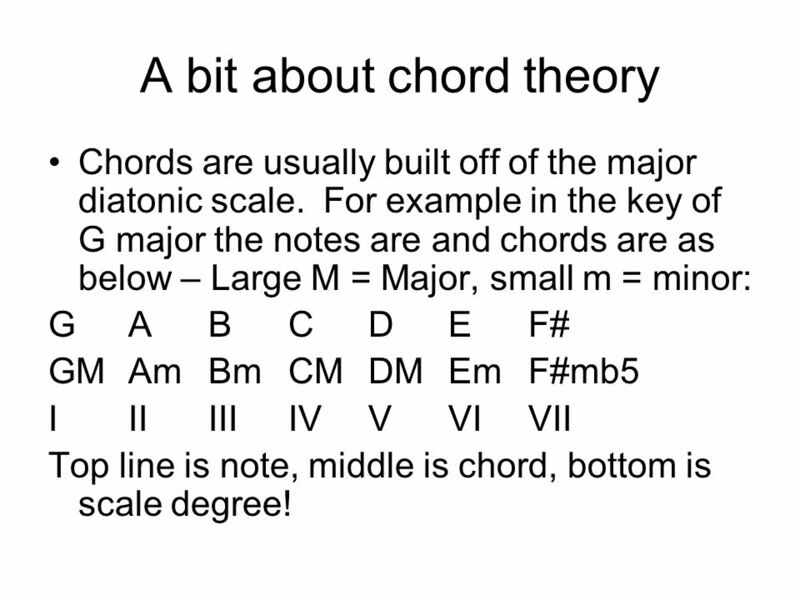 Chords are usually built off of the major diatonic scale. For example in the key of G major the notes are and chords are as below – Large M = Major, small m = minor: G	A	B	C	D	E	F# GM	Am	Bm	CM	DM	Em	F#mb5 I	II	III	IV	V	VI	VII Top line is note, middle is chord, bottom is scale degree! G major (I chord) = G, B, D C major (IV chord) = C, E, G D major (V chord) = D, F#, A Triads are 3 note chords – there are no 7ths and were the first real chords used in music. 7th’s were added a bit later. 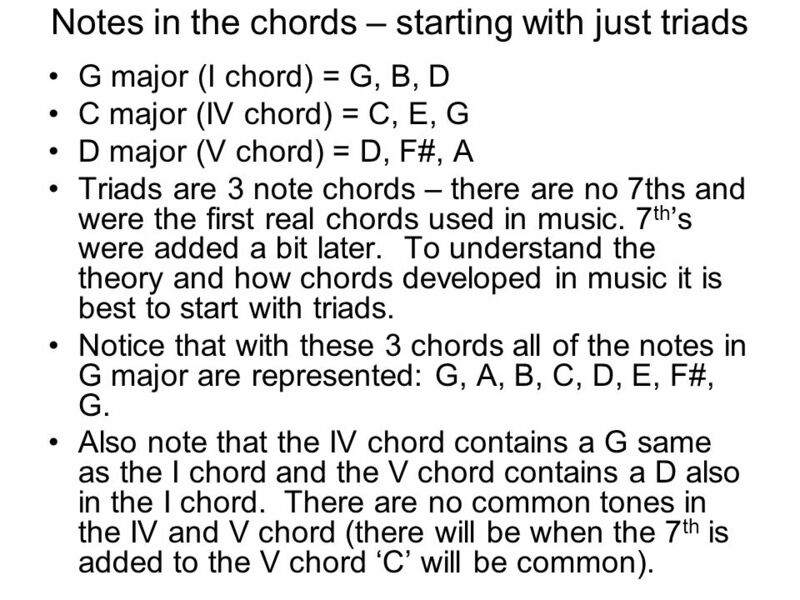 To understand the theory and how chords developed in music it is best to start with triads. Notice that with these 3 chords all of the notes in G major are represented: G, A, B, C, D, E, F#, G. Also note that the IV chord contains a G same as the I chord and the V chord contains a D also in the I chord. There are no common tones in the IV and V chord (there will be when the 7th is added to the V chord ‘C’ will be common). This is most important in the melody of a song or from one chord to the other in the highest voice. For example, in the previous chords the D chord has an F# as the highest note. That is the 3rd of the D major chord (or even the D7 chord). 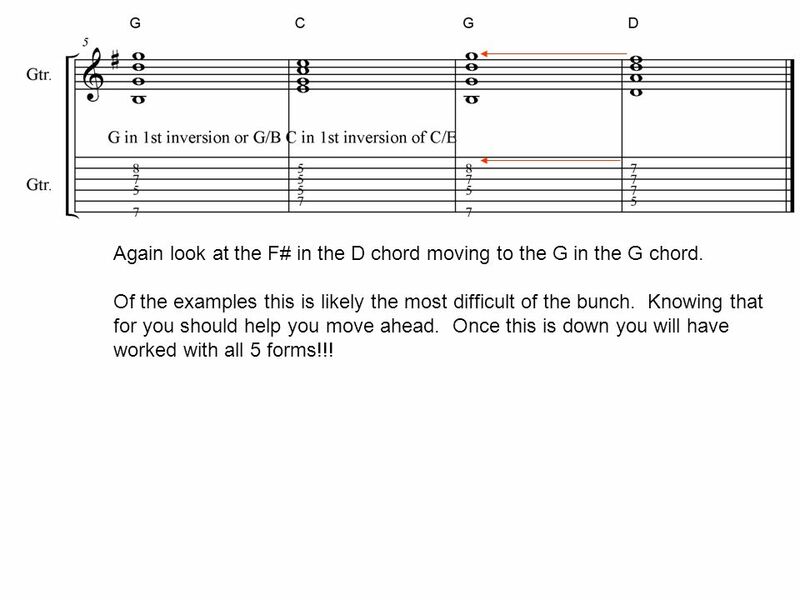 The 3rd of a V chord wants to resolve to the 1st of the I chord so the F# in D wants to resolve to the G in the G chord. Also in this progression the B in the G chord (3rd of the I chord) moves very smoothly to the C in the C chord (1st of the IV chord), (notes on the 3rd string). And then when the C chord or IV chord goes back to the I chord this is just reversed. Notice in this that in all cases from one chord to the next the notes (other than the bass notes) move very smoothly. This will always sound good in any music. This is referred to as good voice leading. It pays off to know the names of the notes in the chord and the relationship to the chord. This is for the more advanced students. Others can try it but it does take some time to master this. Solo to a I IV V progression can be as simple as just playing the notes in the scale. In this case a G major scale. It can be more interesting and more melodic if you use the guide tones – for example for G to C use the melody notes in the scale of B to C and then going from the chords C to G use C to B. When going from D to G use the F# to a G to make a very strong melodic statement. Anyway, the key is to develop a melody. 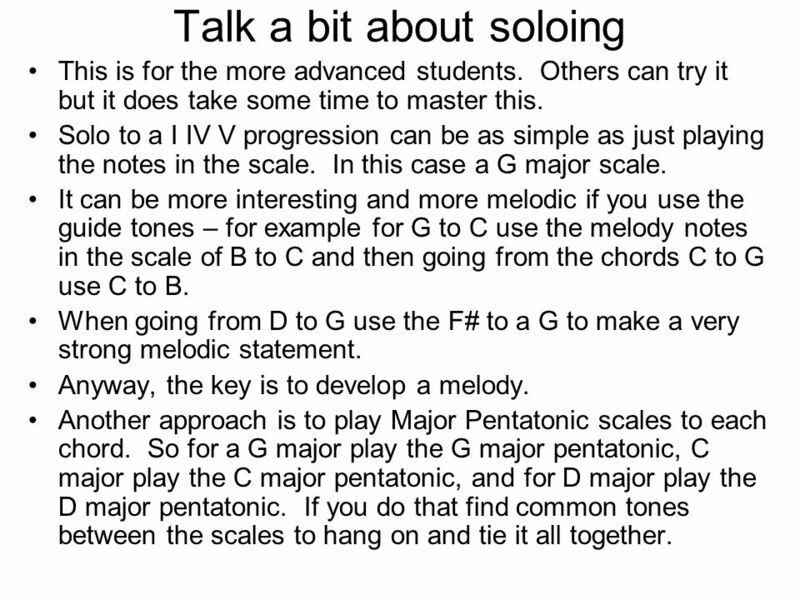 Another approach is to play Major Pentatonic scales to each chord. So for a G major play the G major pentatonic, C major play the C major pentatonic, and for D major play the D major pentatonic. If you do that find common tones between the scales to hang on and tie it all together. 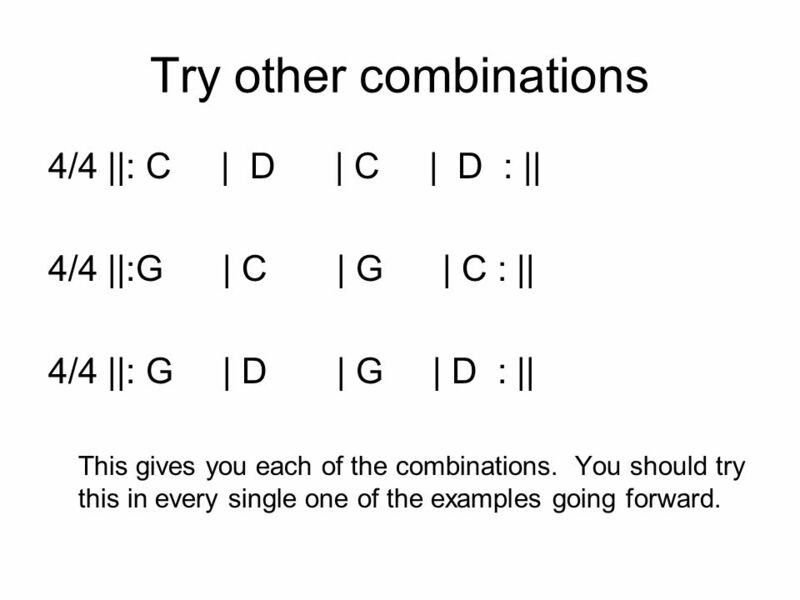 4/4 ||: C | D | C | D : || 4/4 ||:G | C | G | C : || 4/4 ||: G | D | G | D : || This gives you each of the combinations. You should try this in every single one of the examples going forward. Above is with the notes and tablature. With this see how some of the notes move. You will be making some melodies when you do this. Next step is to add some rhythmic interest but you must first master this step. Another topic is endings. In G an authentic ending would be a D to a G (or D7 to G) which is a V to a I. A plagal ending is like the ‘amen’ in church and is a IV to a I or in the key of G and C to a G. For 50’s type tunes it is common to do a IV to a IVm to a I. 13 Move this to other keys Do the same pattern and you will have the I IV and V chord up the neck. For example, at the 4th fret it is Ab Major, 5th fret is A major, 6th fret is Bb major, 7th fret is B major etc. Think of the I – IV and V at each fret. 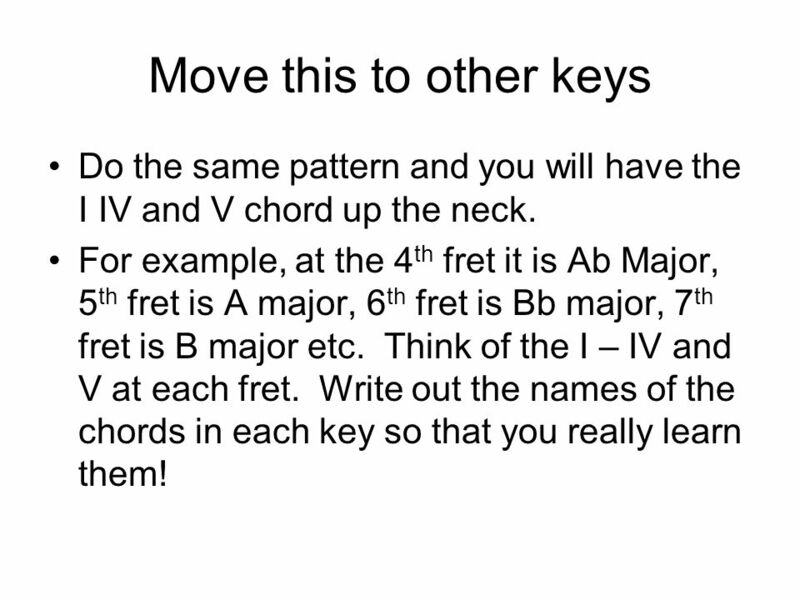 Write out the names of the chords in each key so that you really learn them! 14 Now apply to songs Apply to as many songs as you can. The more songs that you apply this to the more relaxed that you will become at this until it is just 2nd nature to you. Songs will be chosen out of the book and handouts. Try in other keys also. Do the blues in the key of A – such as Jump, Jive, and Wail etc. Also try songs such as Wonderful Tonight – Play the Em at the 7th fret in the Am form or in 1st position for now. 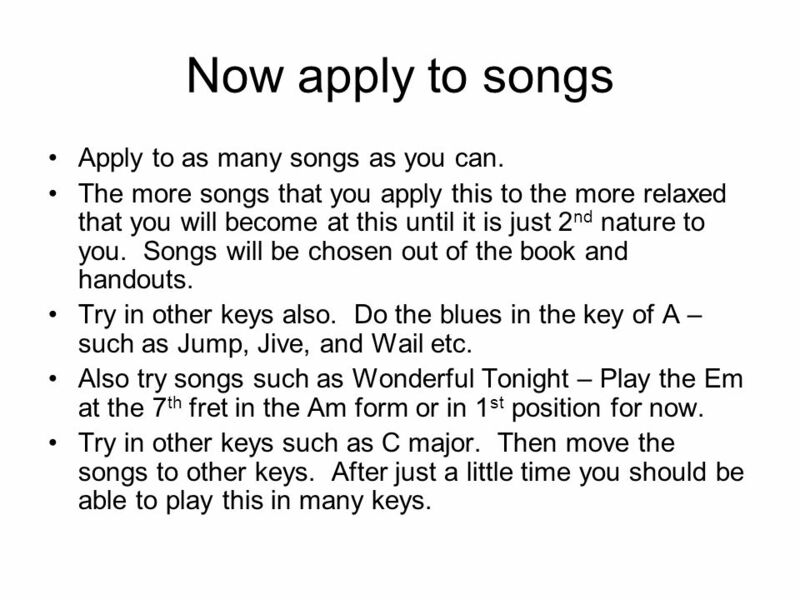 Try in other keys such as C major. Then move the songs to other keys. After just a little time you should be able to play this in many keys. See how this form works below. 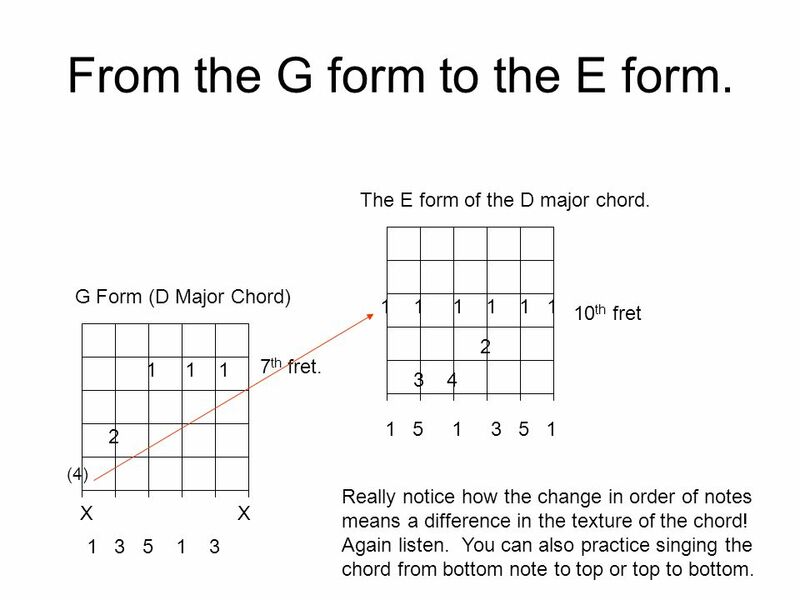 I personally like this form quite a bit and like to go from the E form to this when going to a IV chord (G to C for example). This will be used for the next example! D Form (E Major) D Major One thing that I really like about this particular voicing is how open it sounds. The longer I play the more I appreciate open sounding chords. The large interval between the bass note and the rest of the chord really sets this off. This voicing is used quite a bit in Freddy Green Style playing (Think of Count Basie!) 1 2 1 3 2 3 4 X X 0 0 A D A D F# G# E B E Note you can more the F# on the 1st string 2nd fret to The 6th string 2nd fret (both strings are the same letter Name – it works out better for most cases. As you can see with this form you don’t have to barre. Now you can learn it as a barre based entirely off of the first position D and I would recommend that you try that once this is mastered. Now to do the same progression but in 5th position. Lots of things to notice here. 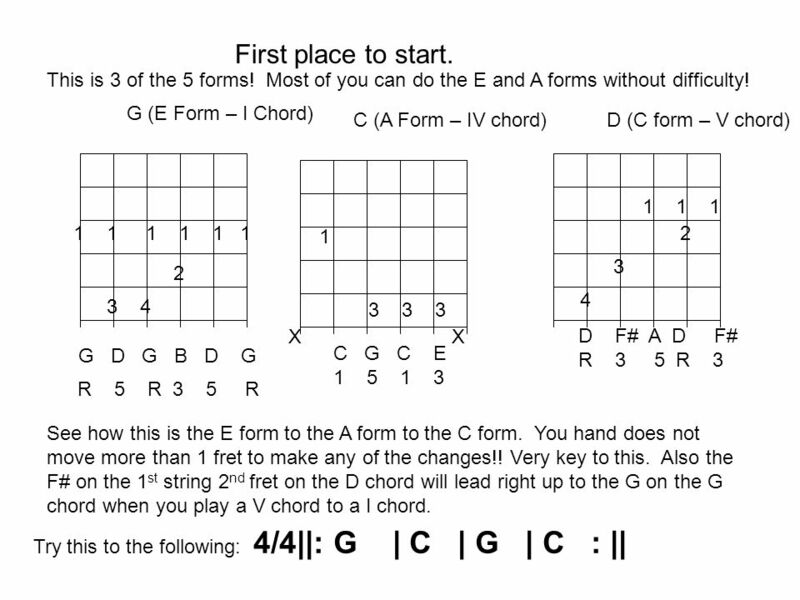 To start notice that the C form is now the V chord. G (D form) 5th fret! 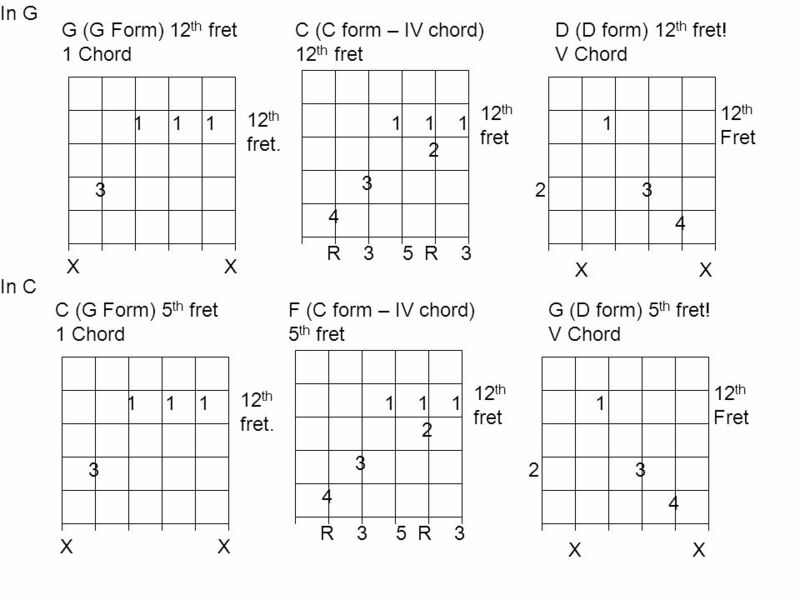 I Chord C (G Form) 5th fret IV Chord D(A form) 5th fret V Chord 5th Fret 1 5th fret. 1 5th fret 2 3 3 4 X X X X X X D A D F# B G D G E G C E 4/4||: G | C | G | C : || Apply to the same progression. 18 Again look at the F# in the D chord moving to the G in the G chord. Of the examples this is likely the most difficult of the bunch. Knowing that for you should help you move ahead. Once this is down you will have worked with all 5 forms!!! Do the same pattern and you will have the I IV and V chord up the neck. For example, at the 4th fret it is Ab Major, 5th fret is A major, 6th fret is Bb major, 7th fret is B major etc. Think of the I – IV and V at each fret. 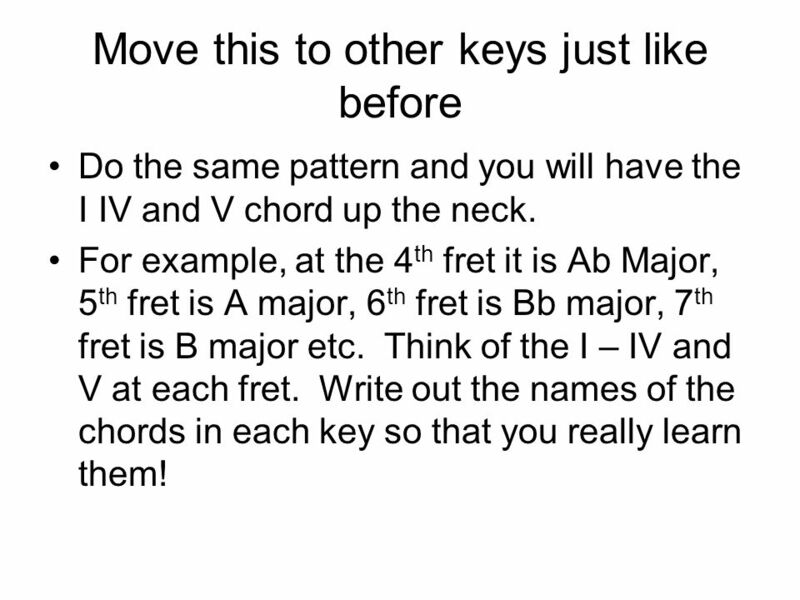 Write out the names of the chords in each key so that you really learn them! Now to do the same progression but in 7th position. Lots of things to notice here. 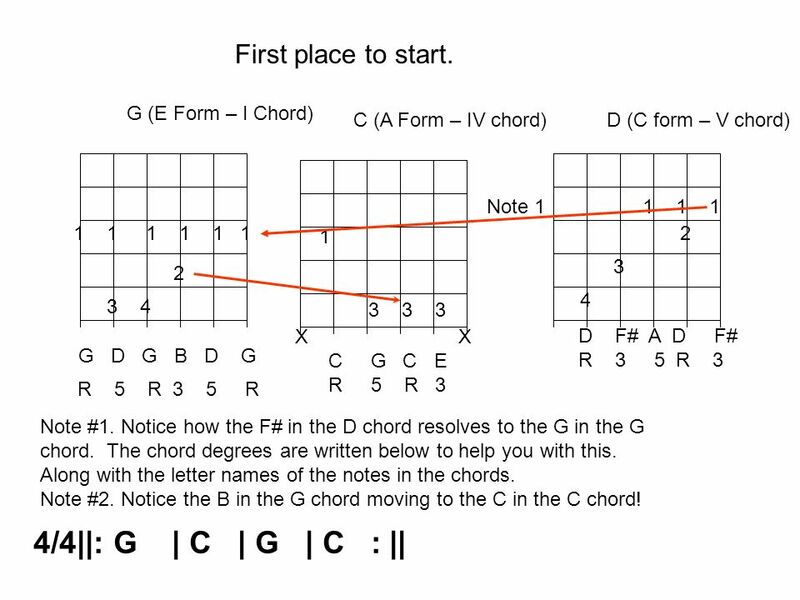 To start notice that the C form is now the V chord. 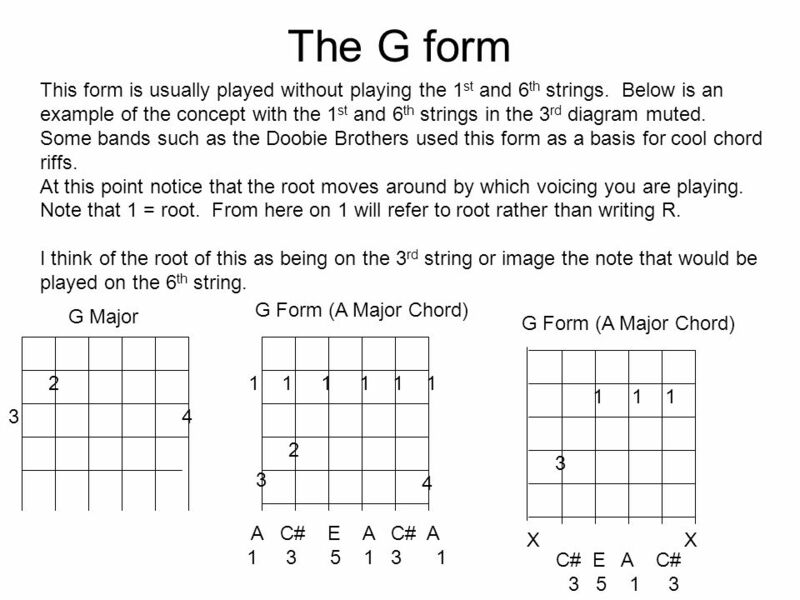 G (C form – 1 chord) 7th fret C (E form – IV chord) 8th fret. D (G Form) 7th fret IV Chord 7th fret 7th fret 2 8th fret 3 2 3 4 3 4 G B D G B R R 3 X X C G G E G C R R R F# A D F# 4/4||: G | C | G | C : || Apply to the same progression. Note how you have already done these forms earlier. So it is just learning where to play them and how they relate to each other. 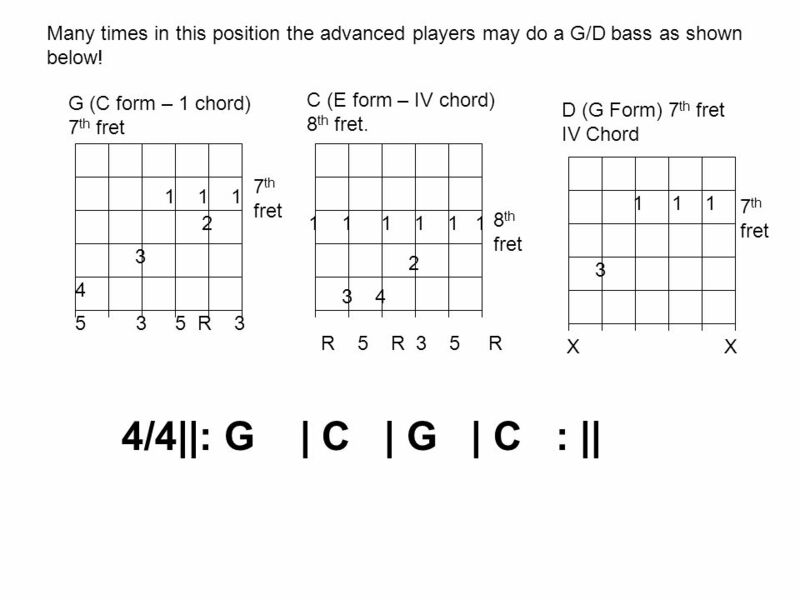 We did the G above in the C form as a D (2nd position) and the C as a G 3rd position and the D in the G form as a C.
21 Many times in this position the advanced players may do a G/D bass as shown below! Here are the 2 ways shown in the previous slides. 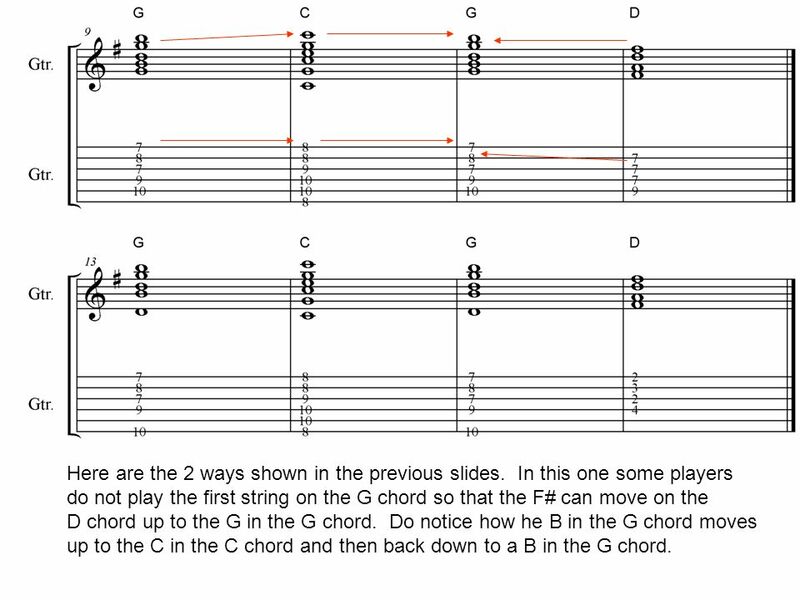 In this one some players do not play the first string on the G chord so that the F# can move on the D chord up to the G in the G chord. Do notice how he B in the G chord moves up to the C in the C chord and then back down to a B in the G chord. I will continue in G but realize that on a classical or even a steel string acoustic that this is difficult to impossible. But you can apply it to other keys. Next page gives it in G major first and then in C major. You should be able to play the one’s in C.
24 G Major G(A form) 10th fret I Chord C (D form) 10th fret! 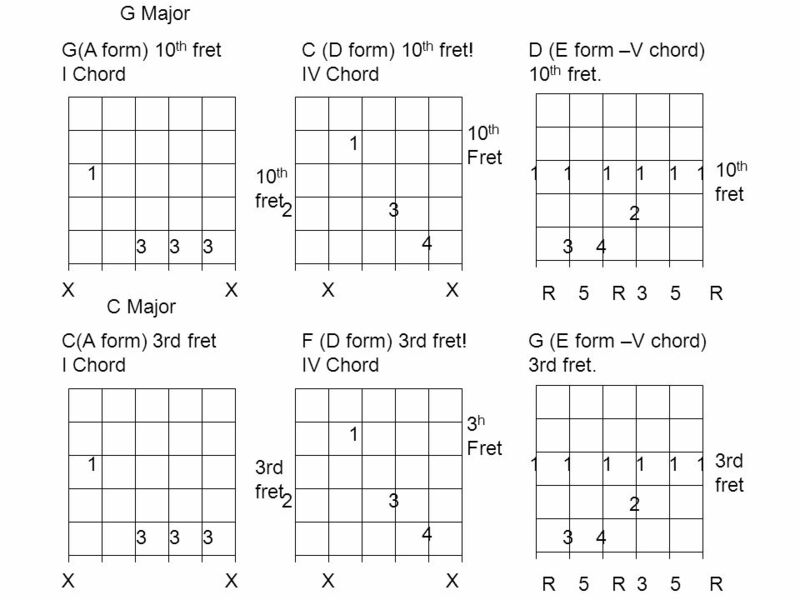 IV Chord D (E form –V chord) 10th fret. 10th Fret 1 1 10th fret 10th fret 2 3 2 4 3 4 X X X X R R R C Major 1 X X C(A form) 3rd fret I Chord 3rd fret 2 3 4 F (D form) 3rd fret! 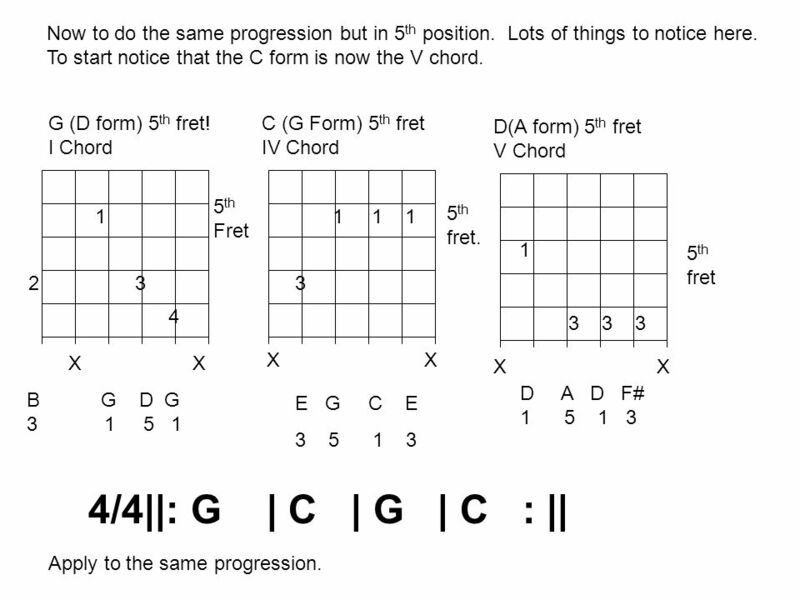 IV Chord X X 3h Fret 3 4 R R R G (E form –V chord) 3rd fret. Here it is in notes and tab in the 10th position. 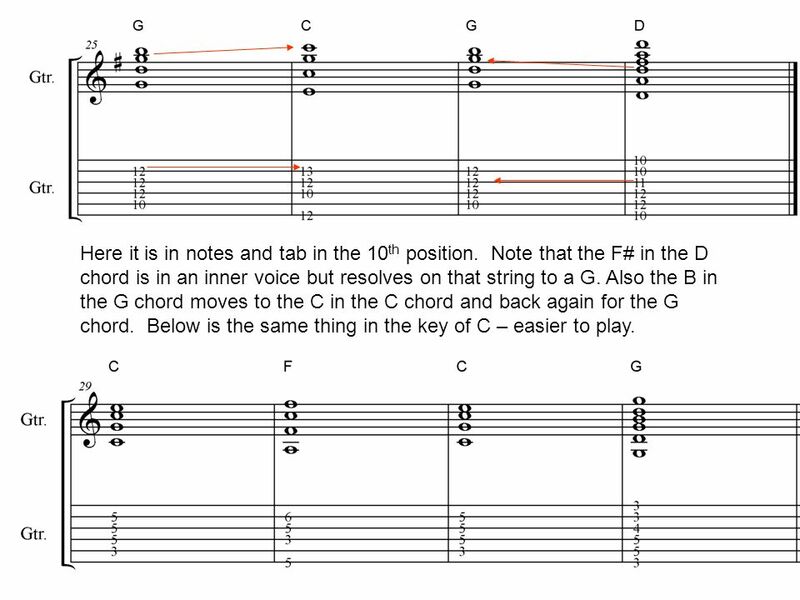 Note that the F# in the D chord is in an inner voice but resolves on that string to a G. Also the B in the G chord moves to the C in the C chord and back again for the G chord. Below is the same thing in the key of C – easier to play. 26 Last set!! 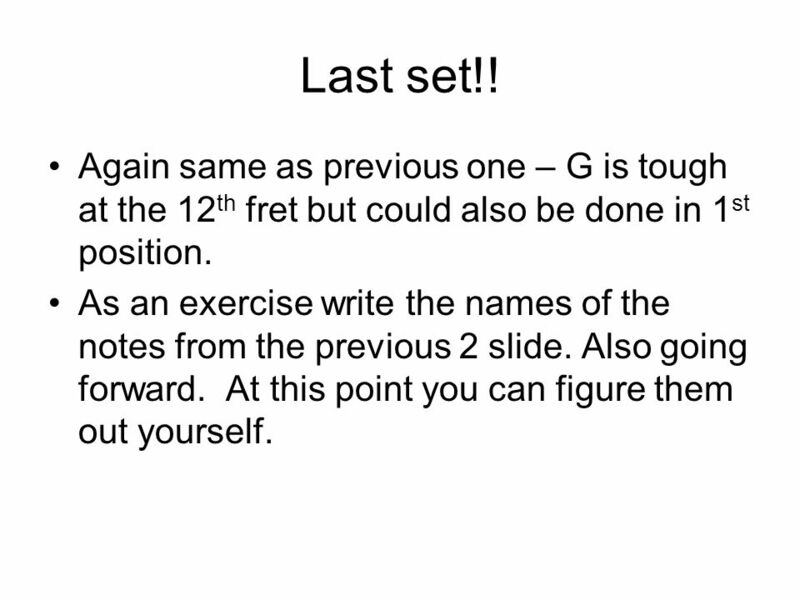 Again same as previous one – G is tough at the 12th fret but could also be done in 1st position. As an exercise write the names of the notes from the previous 2 slide. Also going forward. At this point you can figure them out yourself. 28 Again on this many players would not hit play the 1st string on the C chord. 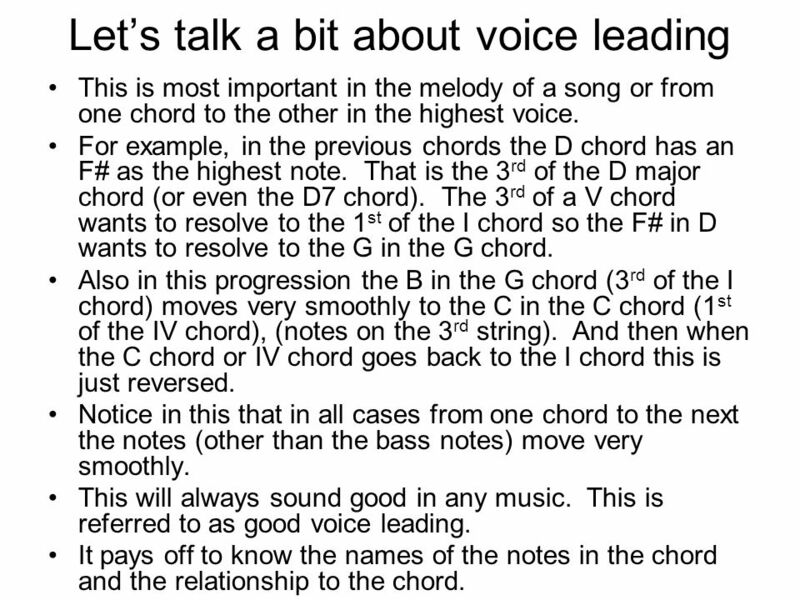 It makes a better voice leading from G to C. Try to think of all of these as the I IV and V and not just the G, C and D chords as you play through this. It isn’t easy but once you have mastered these you are well over the main things that you will need to master the CAGED system as far as chords go. And the major chords lead directly into the scales. 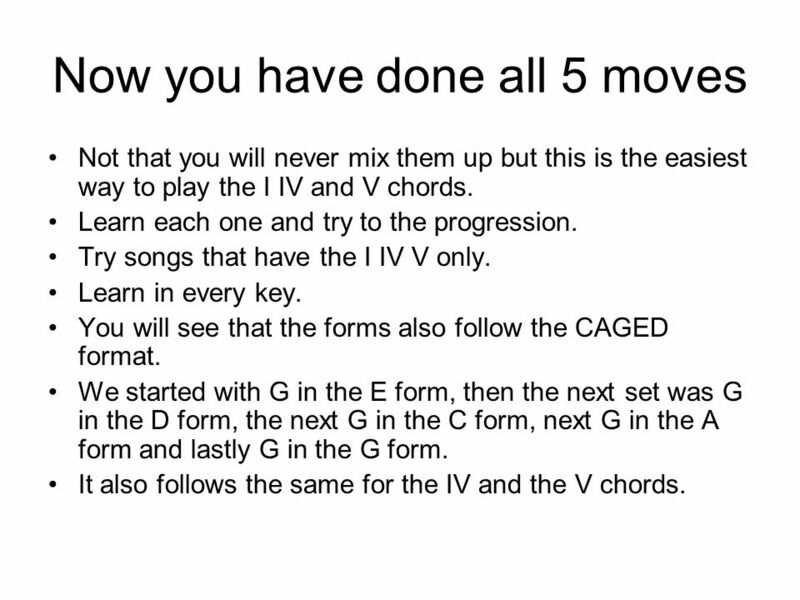 Not that you will never mix them up but this is the easiest way to play the I IV and V chords. Learn each one and try to the progression. Try songs that have the I IV V only. Learn in every key. You will see that the forms also follow the CAGED format. We started with G in the E form, then the next set was G in the D form, the next G in the C form, next G in the A form and lastly G in the G form. It also follows the same for the IV and the V chords. 30 Now going up the neck in one key. 31 From the G form to the E form. See how this form works below. 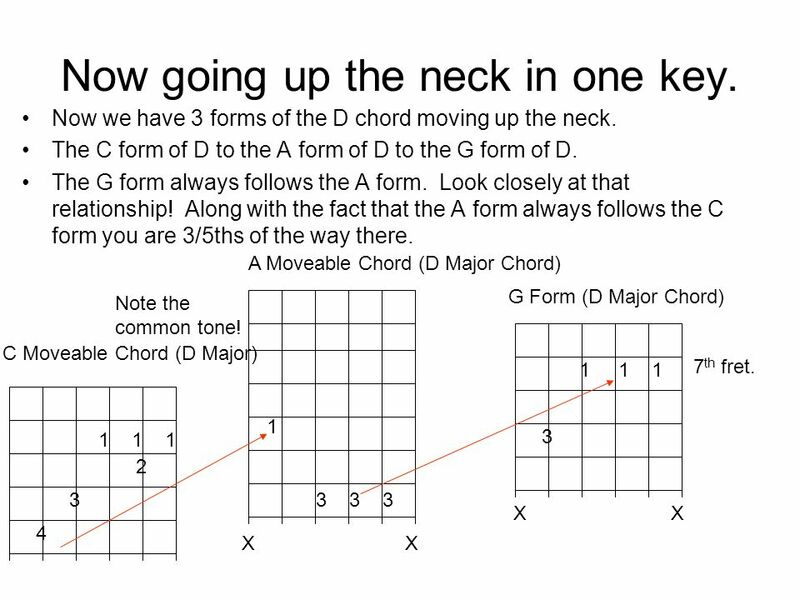 I personally like this form quite a bit and like to go from the E form to this when going to a IV chord (G to C for example). 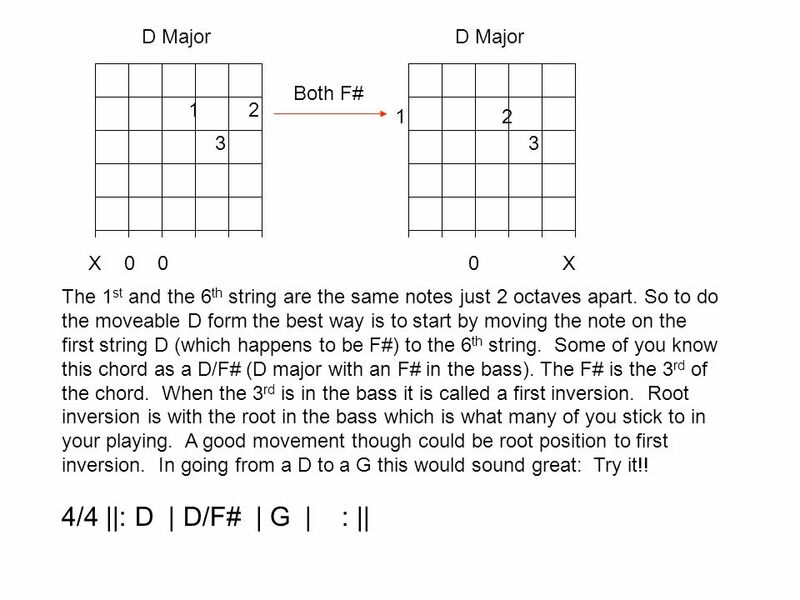 D Form (E Major) D Major 1 2 1 3 2 3 4 X X 0 0 Note you can more the F# on the 1st string 2nd fret to The 6th string 2nd fret (both strings are the same letter Name – it works out better for most cases. As you can see with this form you don’t have to barre. Now you can learn it as a barre based entirely off of the first position D and I would recommend that you try that once this is mastered. 35 E A 1 1 1 1 7th fret 7t Fret 2 3 3 X X Chords for Listen To The Music. Note that on the E you will hammer on the 9th fret with the 3rd finger and on the A hammer the and and 3rd finger on. This is very cool and a good example of using these 2 forms. 4/4 ||: E | A : || Will do the whole song at a later date. 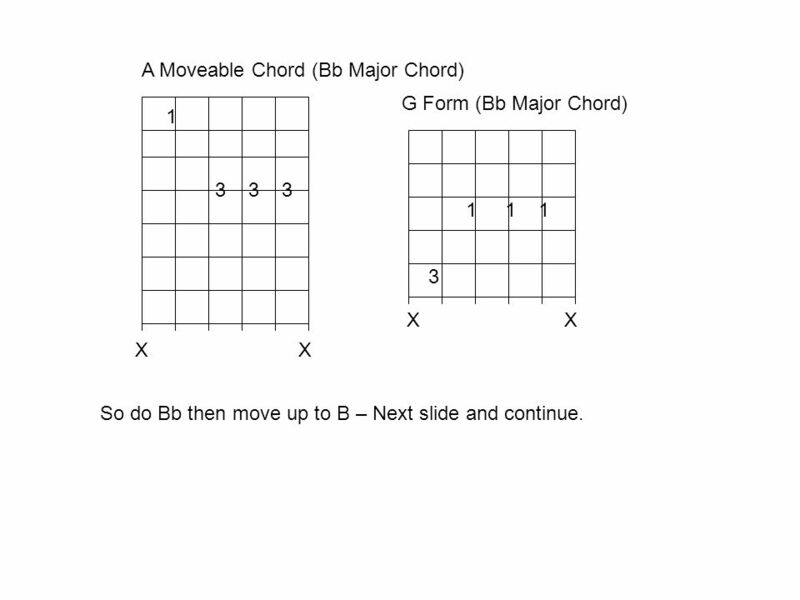 G Form (Bb Major Chord) 1 3 X X X X So do Bb then move up to B – Next slide and continue. 37 Goal for this term Learn all the forms and how to find them up the neck in each position. Make sure you can do the chords across like in this paper. Start to visualize the guitar in the key of G major. 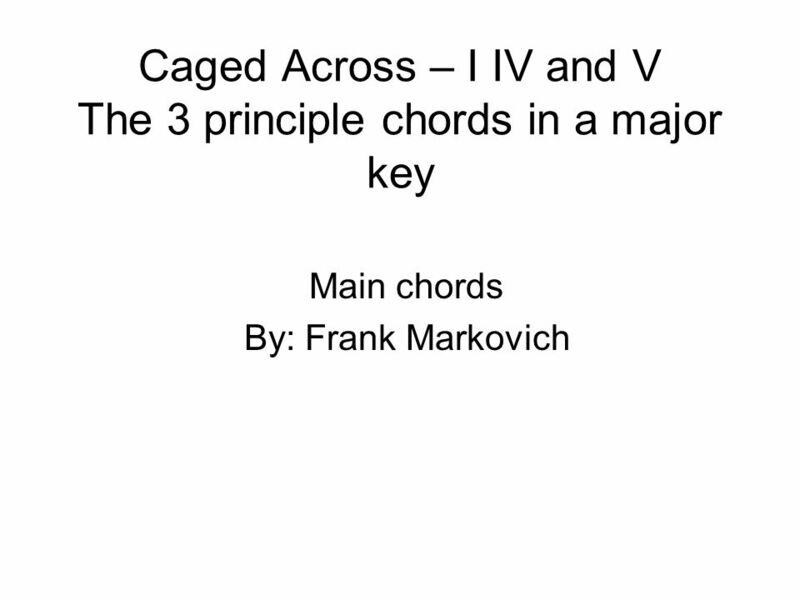 Download ppt "Caged Across – I IV and V The 3 principle chords in a major key"
Class 12 Guitar I and II Blues Cont. 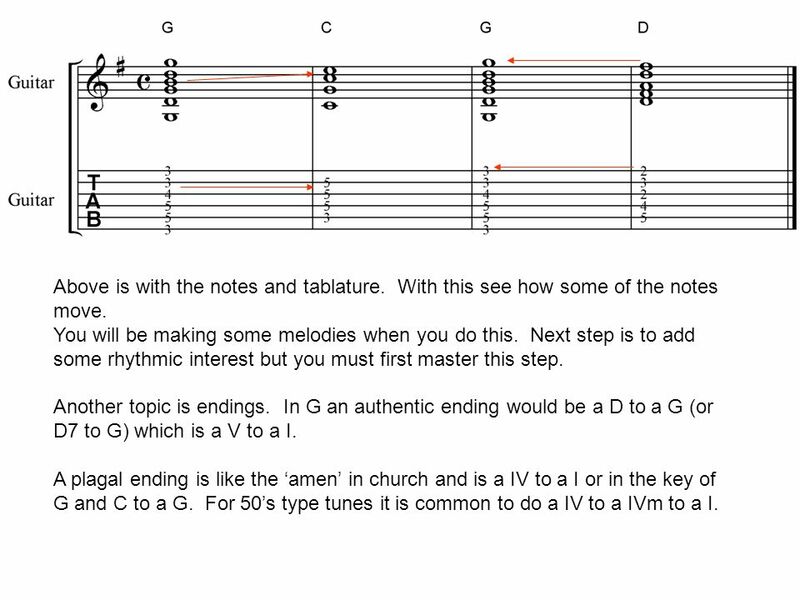 Review Arpeggio Fingerpicking Final for Beginning (Go over what will be on it). The F Chord and G7 Chords Twist and. Guitar I and Guitar II Spring 2005 Class 1 Music 377 Guitar I, Beginning Guitar and Music 378 Guitar II (Beg/Int) Instructor: Frank Markovich Web to pick. 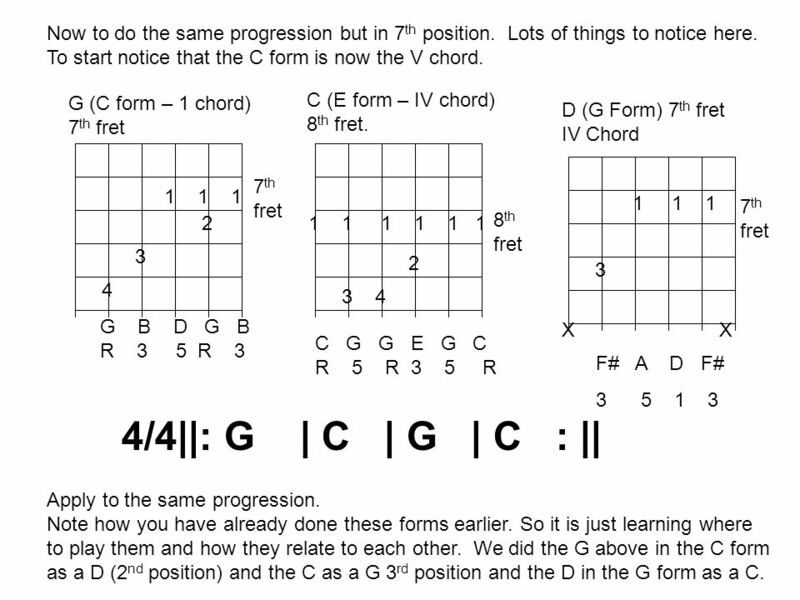 Caged Across – I IV and V Main chords. Blues Backup in 3rds Common way to backup a blues. Do as a shuffle! PART ONE: Working with KEYS. Where do I start? There are two ways most songwriters begin a song: Begin with a riff, bass line or melody Begin with a chord. 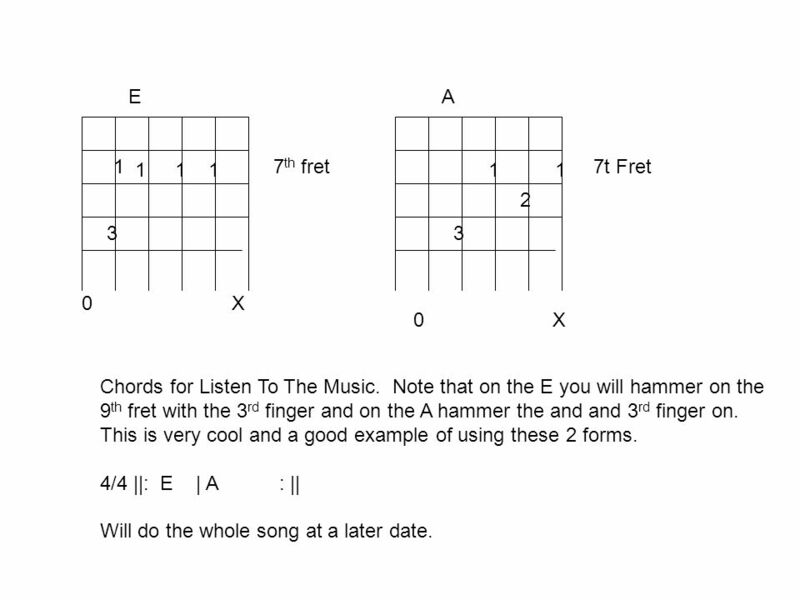 Guitar I and Guitar II Class 5 The A and E7 chords. 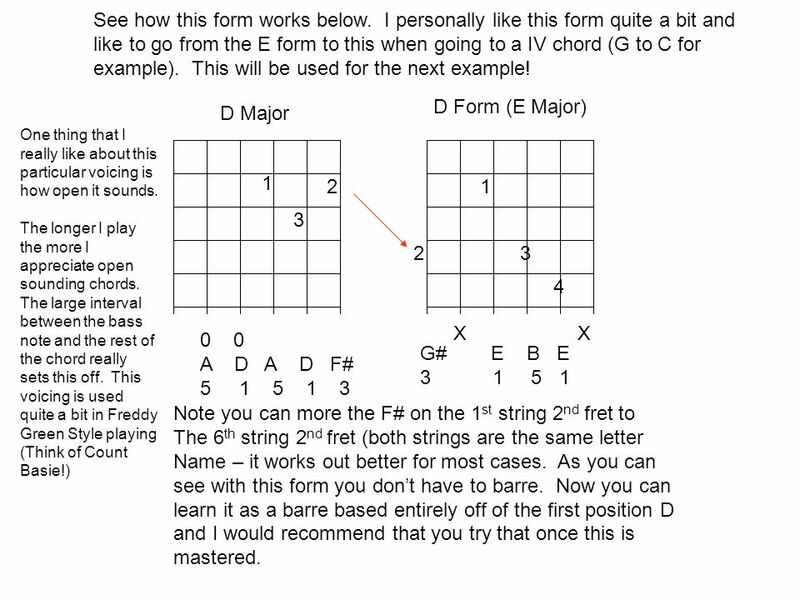 As a review there are so far 3 types of chords – Major, Minor, and Dominant 7 chords. There are 2 other. Parker Blues Some common Parker tunes and other Jazz Blues songs. Hermit’s Hermits Unique Guitar tone for some songs. 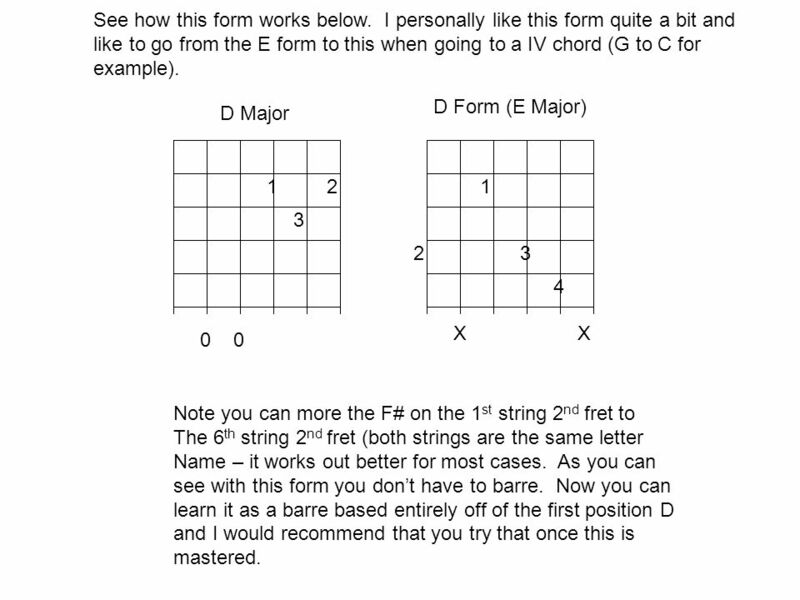 Class 10 Guitar I and II May be all review – class decides!! If not then below. Review the following –12 – Bar Blues in A and E –Blues backup like Chuck. Blue Monk. Another Monk Tune. Melody is usually harmonized in 10 th ’s. Has a New Orleans funeral march feel. Great set of changes to give you a different. Guitar Instruction An Introduction to the Guitar Your Instructor Mr. Anthony Granata Part I The Guitar /An Overview Part II The Notes of the Fretboard. Fingerpicking F. Markovich. Alternating Bass Fingerpicking The most common type of fingerpicking patterns done in American Folk Music is called Travis.